The longer you have your iPhone, chances are the more you’ll find yourself using it for written communications that you used to create on a computer: e-mail, notes, to do lists, appointments, status updates and posts to your social network of choice, and maybe even longer documents. All this writing means a greater possibility for making mistakes, changing your mind, and wanting to move sentences around — in other words, you want to edit your text. iPhone has the basic editing capabilities of copy, cut, and paste, select or select all, even undoing and redoing. In Mail, you can stylize your text by making it bold, italic, or underlined and indented. Tap the text you want to edit. The keyboard appears and the cursor blinks more or less where you tapped. Press and hold your finger in the general area where you want to insert the cursor. A magnifying loupe appears over the text with the cursor in the center. Drag your finger over the text until the cursor is at the point where you want it. Two buttons appear: Select and Select All, and sometimes a third, Paste, when you have cut or copied text from somewhere else. Tap Select to select the word or portion of the text; tap Select All to select the entire text. The word is highlighted in blue and there are blue grab points on the upper left and lower right corner. 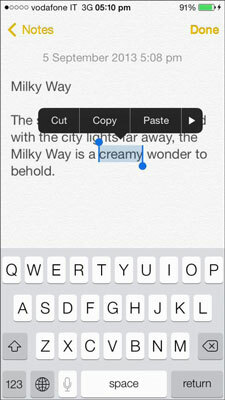 If you select just one word, you can cut or copy that word, or if you tap the arrow on the far right, iPhone offers to replace the word with its idea of auto-correct (for example, for creams, the suggested replacements were dreamy, creaky, or cream’s) or define the selected word — just tap the appropriate button. If you don’t want to use Select or Select All, tap once on the screen and proceed to edit with the delete key and keyboard. 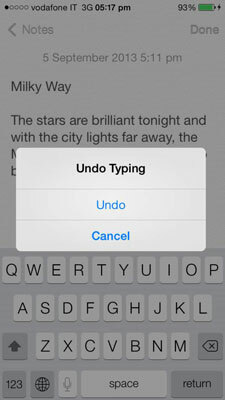 To select a portion of the text, touch and drag the blue grab points to select the text you want to cut or copy. If you want to delete, press the cut button. If you want to copy or cut, and paste in another location, read on. Following the previous steps to select the text you want to copy. After you’ve tapped Select or Select All, a Copy button appears above the highlighted text. Open the document in the app where you want to place the copied text. If, from our example, Notes is already open, then tap the Notes screen in the open apps carousel. Otherwise, press the Home button to open the Home screen and tap Notes from there. Tap and hold on the screen where you want to insert the copied text. The magnifying loupe appears, allowing you to move the cursor precisely where you want it. Your copied text is now in a new spot. Copying and pasting isn’t only for text within apps like Notes and Mail. You can copy a portion of a web page and paste it into an e-mail. Press and hold the part of the page you want to copy and the blue grabbers come up, along with a Copy button. Drag the grab points to select everything you want to copy, and then tap the Copy button. Open the app where you want to paste the selection. Press and hold until you see the Paste button. Tap Paste. To undo your edit, shake your iPhone. A message opens with the option to undo the last action or cancel. Tap the Undo button and you’re home free. And if you want to redo what you thought you wanted to undo? Just shake your iPhone again and the buttons ask if you want to redo or undo or cancel.